Norman Rockwell Thanksgiving paintings perfectly capture the spirit of our favorite autumn holiday. During his stint as America's favorite illustrator, Rockwell painted Thanksgiving scenes many times. The most famous Norman Rockwell Thanksgiving painting, of course, was one of the Four Freedoms, Freedom From Want published in 1943 inside The Saturday Evening Post. The Post was Rockwell's preferred vehicle for most of his paintings. He considered the Post to be a picture window into which over a million Americans gazed each week. This gallery of Norman Rockwell Thanksgiving paintings will be spread over several pages. Please contact me if you have any suggestions. Without further ado, here they are. I have attempted to present them in chronological order. Not in the order they were painted, but in their order as Thanksgiving Day scene. Cousin Reginald was both Rockwell's scapegoat and his hero in the early covers painted for The Country Gentleman. In all Rockwell painted fifteen covers featuring Cousin Reginald and related characters. This was the sixth in the series. Cousin Reginald was always having misfortune caused by his unfamiliarity with "country" ways. This Thanksgiving painting is no different. We know that the turkey will eventually be caught, subdued, processed and eaten. But we do not know what toll Thanksgiving will take on poor Cousin Reginald. We do not know if he will even want to eat the turkey after this trauma. But his country cousins are certainly having a ball watching the scene unfold. Most of us do not invest this much effort into Thanksgiving dinner. This young Pilgrim is bringing home the turkey. His Native American Indian friends apparently do not like that. Arrows are flying past and behind him. One arrow has even peirced his hat. We can infer from the reaction that he has evidently "swiped" the turkey from the natives. Surely they would not have been this upset if he had just killed it himself. Unless maybe he was hunting in a forbidden spot. My favorite part of this painting is the Pilgrim's facial expression as he watches one of the arrows narrowly missing him. He actually seems unaware of the arrow stuck in his hat. He is really working up an appetite! This was the only Norman Rockwell Thanksgiving painting published by Life magazine. Get the turkey ready to cook. Now that the turkey has been caught and brought home, it's time to prepare it. This turkey has been shipped "From Aunt Mary & Uncle Bob." And it has arrived just in time for the Thanksgiving feast. It is unclear whether or not the same relatives shipped the many vegetables lying beside the crate. Either way, the meal looks like it is on its way. A curiosity about this painting: Rockwell temporarily abandonned his insistence on strict realism for a one small part of this painting. The canary and cage were painted not from a real life model, but from a bird seed catalog. 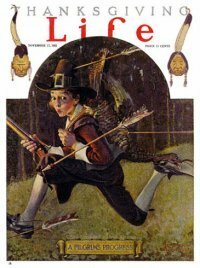 This was the second of two Norman Rockwell Thanksgiving illustrations to appear on the cover of The Literary Digest. Welcome the Family and Their Help. Some of the best moments in life are those spent with family members, doing seemingly mundane chores. This is especially true when the family member has been gone for a while. Of course, not everybody in the family will want to help peel potatoes. Not everybody will have KP experience and be so adept at peeling potatoes. Some of the family may just help set the table. Everybody can contribute. Put them to work. There's plenty to go around. Some may even volunteer to bring deserts. Those folks rank higher on my list than the table setters. Don't Forget to Return Thanks. 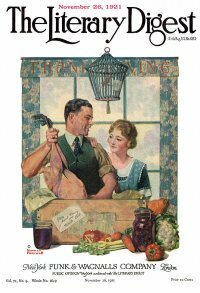 This Rockwell Thanksgiving painting was painted and published during World War Two. This painting reminds us that there are many people in the world who would be grateful for any source of nourishment, physical and spiritual. Rockwell shows a refugee in war-torn Italy being thankful for a serving of an American soldiers field rations, as well as thankful for his field jacket. The meagerness of her meal contrasts visibly with the two turkey feasts shown on the next page. It is hard to imagine that the partakers in those feasts will be more thankful than this young World War II refugee. Do You Have A Great Story or Opinion About Norman Rockwell Thanksgiving Gallery? Do you have a personal story or opinion about our Norman Rockwell Thanksgiving?